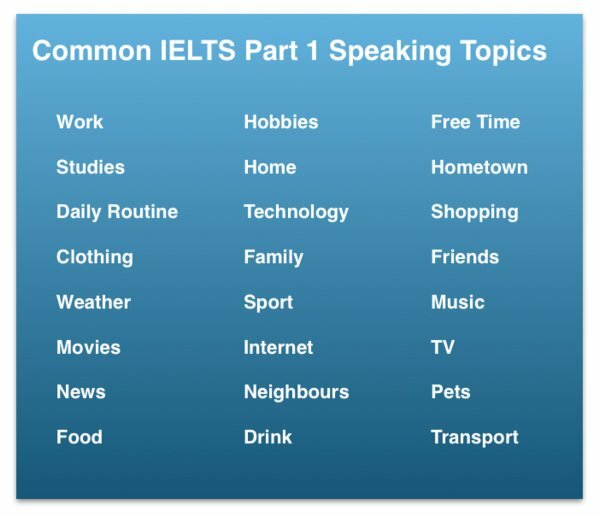 IELTS Speaking test part 1, common topics and examples. Another point to remember is: Do not just give one word answers or simple basic answers, however , do not go into too much detail or very long answers. Use your common sense and give a natural full response to the questions. Here are some common topics that could come up. Using Fillers and Discourse markers. Caution: Do not over use fillers because it will cause problems with your fluency score in the exam. 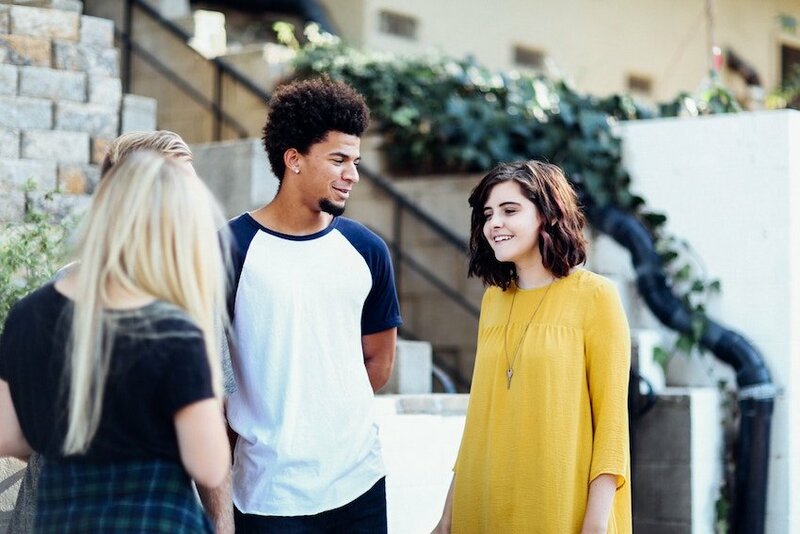 “You know” is very common when native speakers are talking, It is casual and informal and most people don’t realise they are saying it. It sounds like “ya know” …but do not overuse this, certainly do not use this in writing. Here is an interesting discussion about using “you know” click here for more info. These sounds and phrases make the conversation more natural and less robotic… but you have to make sure they are natural to you otherwise it sounds like you are just memorising everything. Click here for an interesting article about fillers. Directly answer the question: Most part 1 topics are about you and your experience. Talk naturally: The speaking test in IELTS is not a formal talk, you can use everyday informal language. Pronunciation: Intonation, word stress and linked sounds are very important, make sure you can get someone to give you feedback on your pronunciation if this is a problem as this is marked in the exam. Record yourself: Get your smartphone and record yourself answering the questions, then play back the recording paying attention to grammar, vocabulary, hesitation issues, pronunciation and intonation. Keep your answers concise: In part 1 you don’t need to go into too much detail, but don’t give short answers either. Part 3 is where you can go into detail and give longer examples. Do not over use the ‘umm ahh’ sounds in your talk as it will affect your fluency, you must keep the pace and keep talking naturally. Hesitation is noted by the examiner and will affect your score. Answer: well, I work part time at the moment, I’m a cashier at a convenience store. I work most days and have the weekend off. I’m a student at an English school here also.. so I’m keeping myself pretty busy . Do you like your job / studies? Answer: Not really, most of the time it’s so busy that when I get home I’m just completely exhausted. But , ..you know, it’s part time and I get perks such as free groceries, so, I suppose it’s not really that bad and the pay is rather good. As for my studies, I quite like my English school, I get on well with my class mates. Is that a popular job in your country? Answer: A cashier? well,I’d say for university students it’s kind of popular, It helps them to earn some income while studying. Working in a bar or restaurant is also a popular job for students in my country like being a waiter or kitchen staff. I guess the most popular career in my country is a Doctor. What kind of job would you like to do in the future? Answer: When I have free time I like to either watch TV or chat with my friends online. I’m not an active person so I’m not really into sports to be honest. I reckon I’m pretty lazy actually..
What is a common free time activity in your country? Answer: In my country.. err ..I think shopping or going to the movies is popular. Also some people like to play team sports like football or tennis. so.. you know, It depends on the person I guess. Do people in your country have enough free time? Answer: To be honest I don’t think people have enough free time, because so many people work overtime these days , and, you know, they are worried about losing their jobs so they don’t complain to their boss..a lot of people I know work on weekends too. What did you used to do in your free time as a child? Answer: When I was a kid I often used to go to the park with my dad, yeah, I loved playing at the park after school. Also I used to go to the beach on Sundays because we lived not far from the beach. I remember learning how to surf but I wasn’t very good. Answer: I always use my computer when doing my studies, especially for studying English, I often go on Youtube or English websites. I also use Whats app and Facebook to contact friends. Actually I spend most of the time on my iPad. Answer: I’m online everyday, sometimes too much..you know, I spend hours online chatting or browsing the internet and using Facebook.. actually er..maybe I’m an internet addict..
What do you dislike about using a computer? Answer: I really can’t stand a slow computer, My desktop PC is really slow because it’s about 8 years old now..so yeah, I think it’s time to get a new one actually. That’s why I’m always on my iPad or smartphone. Do you prefer to use a smartphone or a laptop? Answer: I would have to say that I prefer a smartphone or an iPad, they are faster and more convenient.. I can’t take my Laptop everywhere because it’s old and quite heavy , and I like to be online a lot..so I think a smartphone or tablet is much better for me.